For other uses, see Brian Cox (disambiguation). Brian Edward Cox OBE, FRS (born 3 March 1968) is an English physicist who serves as professor of particle physics in the School of Physics and Astronomy at the University of Manchester. He is best known to the public as the presenter of science programmes, especially the Wonders of... series and for popular science books, such as Why Does E=mc²? and The Quantum Universe. He has been the author or co-author of over 950 scientific publications. Cox has been described as the natural successor for BBC's scientific programming by both David Attenborough and Patrick Moore. Before his academic career, Cox was a keyboard player for the bands D:Ream and Dare. Cox was born on 3 March 1968 in the Royal Oldham Hospital, later living in nearby Chadderton from 1971. His parents worked for Yorkshire Bank, his mother as a cashier and his father as a middle-manager in the same branch. He recalls a happy childhood in Oldham that included pursuits such as dance, gymnastics, plane spotting and even bus spotting. He attended the independent Hulme Grammar School in Oldham from 1979 to 1986. He has stated in many interviews and in an episode of Wonders of the Universe that when he was 12, the book Cosmos by Carl Sagan was a key factor in inspiring him to become a physicist. He said on The Jonathan Ross Show that he performed poorly on his maths A-level exam: "I got a D ... I was really not very good ... I found out you need to practise." In the 1980s and early 90s, Cox was a keyboard player with the rock band Dare. Dare released two albums with Cox – Out of the Silence in 1988 and Blood from Stone in 1991. He joined D:Ream, a group that had several hits in the UK charts, including the number one "Things Can Only Get Better", later used as a New Labour election anthem, although he did not play on the track. Cox studied physics at the University of Manchester during his music career. He earned a Bachelor of Science degree with first-class honours and a Master of Philosophy degree in physics. After D:Ream disbanded in 1997, he completed his Doctor of Philosophy degree in high-energy particle physics at the University of Manchester. His thesis, Double Diffraction Dissociation at Large Momentum Transfer, was supervised by Robin Marshall and based on research he did on the H1 experiment at the Hadron Elektron Ring Anlage (HERA) particle accelerator at the DESY laboratory in Hamburg, Germany. Cox was a PPARC[needs update][when?] advanced fellow and member of the high energy physics group at the University of Manchester, and works on the ATLAS experiment at the Large Hadron Collider (LHC) at CERN, near Geneva, Switzerland. He is working on the research and development project of the FP420 experiment in an international collaboration to upgrade the ATLAS and the Compact Muon Solenoid (CMS) experiment by installing additional, smaller detectors at a distance of 420 metres from the interaction points of the main experiments. Cox has co-authored several books on physics including Why does E=mc2? and The Quantum Universe, both with Jeff Forshaw. He has supervised or co-supervised several PhD students to completion including Tamsin Edwards and several others. Cox has appeared in many science programmes for BBC radio and television, including In Einstein's Shadow, the BBC Horizon series, ("The Six Billion Dollar Experiment", "What on Earth is Wrong with Gravity? ", "Do You Know What Time It Is? ", and "Can we Make a Star on Earth?") and as a voice-over for the BBC's Bitesize revision programmes. He presented the five-part BBC Two television series Wonders of the Solar System in early 2010 and a follow up four-part series, Wonders of the Universe, which began on 6 March 2011. Wonders of Life, which he describes as "a physicist's take on life/natural history", was broadcast in 2013. He co-presents Space Hoppers and has also featured in Dani's House on CBBC. Cox also presented a three-part BBC series called Science Britannica which sees him explore the contribution of British scientists over the last 350 years, as well as the relationship between British science and the public perception thereof. BBC Two commissioned Cox to copresent Stargazing Live, a three-day live astronomy series in January 2011 – co-presented with physicist-turned-comedian Dara Ó Briain and featuring chat show host Jonathan Ross – linked to events across the United Kingdom. A second and a third series featuring a variety of guests ran in January 2012 and January 2013. Since November 2009 Cox has co-presented a BBC Radio 4 "comedy science magazine programme", The Infinite Monkey Cage with comedian Robin Ince. Guests have included comedians Tim Minchin, Alexei Sayle, Dara Ó Briain, and scientists including Alice Roberts of the BBC show The Incredible Human Journey, and astrophysicist Neil deGrasse Tyson. Cox also appeared in Ince's Nine Lessons and Carols for Godless People. He is a regular contributor to the BBC 6 Music Breakfast Show with Shaun Keaveny, with a weekly feature. He appeared on 24 July 2009 episode of Robert Llewellyn's CarPool podcast series. Cox has also appeared numerous times at TED, giving talks on the LHC and particle physics. In 2009 he appeared in People magazine's Sexiest Men Alive. In 2010 he was featured in The Case for Mars by Symphony of Science. In November 2010 he made a promotional appearance in the Covent Garden Apple Store, talking about his new e-book set to accompany his new television series as well as answering audience questions. Cox gave the Royal Television Society's 2010 Huw Wheldon Memorial Lecture on "Science, a Challenge to TV Orthodoxy", in which he examined problems in media coverage of science and news about science. It was subsequently broadcast on BBC Two. On 4 March, a talk entitled "Frankenstein's Science" at the National Theatre featured Cox in discussion with biographer Richard Holmes on Mary Shelley's exploration of humanity's desire to bring life to an inanimate object and whether the notion is possible, in both the 19th century and today. On 6 March 2011, Cox appeared as a guest at Patrick Moore's 700th episode anniversary of The Sky at Night. He has said that he is a lifelong fan of the programme, and that it helped inspire him to become a physicist. On 10 March 2011, he gave the Ninth Douglas Adams Memorial Lecture. Cox was the science advisor for the science fiction film Sunshine. On the DVD release, he provides an audio commentary where he discusses scientific accuracies (and inaccuracies) depicted in the film. He also was featured on the Discovery Channel special Megaworld: Switzerland. In 2013, he presented another series of "Wonders of Life". On 14 November 2013, BBC Two broadcast The Science of Doctor Who in celebration of Doctor Who's 50th anniversary, in which Cox tackles the mysteries of time travel. The lecture was recorded at the Royal Institution Faraday Lecture Theatre. The BBC subsequently broadcast Human Universe and Forces of Nature also presented by Cox. In 2017, Cox appeared in the children's television programme Postman Pat, voicing space expert Professor Ryan Farrow. Doctor Who Himself "The Power of Three"
Cox has received many awards for his efforts to publicise science. In 2002 he was elected an International Fellow of The Explorers Club and in 2006 he received the British Association's Lord Kelvin Award for this work. He held a prestigious Royal Society University Research Fellowship (an early-career Research Fellowship scheme) from 2006 to 2013. A frequent lecturer, he was keynote speaker at the Australian Science Festival in 2006, and in 2010 won the Institute of Physics Kelvin Prize for his work in communicating the appeal and excitement of physics to the general public. He was appointed Officer of the Order of the British Empire (OBE) in the Queen's 2010 Birthday Honours for services to science. On 15 March 2011, he won Best Presenter and Best Science/Natural History programme by the Royal Television Society for Wonders of the Universe. On 25 March 2011, he won twice at the Broadcasting Press Guild Awards for 'Best Performer' in a non-acting role, while Wonders of the Solar System was named best documentary series of 2010. In July 2012, Cox was awarded an honorary doctorate from the University of Huddersfield. Later that year, he was awarded the Institute of Physics President's medal by Sir Patrick Stewart, following which he gave a speech on the value of education in science and the need to invest more in future generations of scientists. On 5 October 2012 Cox was awarded an honorary doctorate by the Open University for his "Exceptional contribution to Education and Culture". In 2012 he also was awarded the Michael Faraday Prize of the Royal Society "for his excellent work in science communication." He was elected a Fellow of the Royal Society (FRS) in 2016. Cox has voiced his concerns about Brexit saying he feels it is a "weakening of our interaction with our neighbouring countries" and that "it cannot be the right trajectory." On 23 June 2018, the People's Vote march was held in London to mark the second anniversary of the referendum to leave the European Union. Cox tweeted that, "if [a people's vote were] held on known exit terms and leave commanded majority, I'd back it as settled, informed decision. That's my argument for having one." In 2003, Cox married U.S. science presenter Gia Milinovich in Duluth, Minnesota. They have a son born in 2009, and Milinovich has a son from a previous relationship. The family currently lives in Battersea. Cox rejects the label atheist but has stated he has "no personal faith." In 2009, he contributed to the charity book The Atheist's Guide to Christmas. He is a humanist, and is a Distinguished Supporter of Humanists UK. He is an Oldham Athletic fan and held a season ticket at the club. ^ a b Edwards, Tamsin L. (2006). Diffractively produced Z bosons in the muon decay channel in pp collisions at √s=1.96 TeV, and the measurement of the efficiency of the DØ Run II Luminosity Monitor (PhD thesis). University of Manchester. doi:10.2172/892267. OCLC 930686728. Copac 36713207. ^ "Cox, Brian E. – Profile – INSPIRE-HEP". ^ "BBC – Search results for brian cox". BBC. 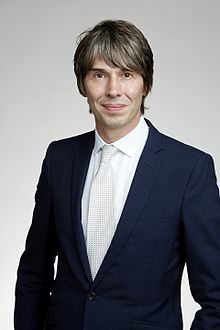 ^ "'Brian Cox effect' leads to surge in demand for physics". The Daily Telegraph. 30 January 2013. Retrieved 30 January 2013. ^ "Prof Brian Cox – publications". University of Manchester. Archived from the original on 13 September 2016. Retrieved 18 August 2016. ^ "Sir David Attenborough says he would like to pass on the baton to Professor Brian Cox". The Daily Telegraph. 30 January 2013. Retrieved 30 January 2013. ^ "Brian Cox? He's no astronomer! Patrick Moore turns his telescope on the young pretender – and concedes he's really rather good (for an ex-rock star)". Daily Mail. 24 January 2012. Retrieved 30 January 2013. ^ a b c Smith, David (14 September 2008). "Putting the fizz into physics". The Observer. London. Retrieved 14 September 2008. ^ "The Times Saturday September 12th 2015 Weekend section". ^ "Oldham Hulme Grammar Alumni". Oldham Hulme Grammar School. Archived from the original on 18 December 2013. ^ "Congratulations to Professor Brian Cox OBE". Oldham Hulme Grammar School website. 17 June 2010. Archived from the original on 8 March 2011. Retrieved 3 March 2011. ^ "Alumni". Oldham Hulme Grammar School website. Oldham Hulme Grammar School. Archived from the original on 7 July 2013. Retrieved 23 May 2013. ^ "Brian Cox: Science is not 'dominated by old men'". BBC News. 2 February 2011. Retrieved 3 March 2011. ^ "BBC Two Programmes – Wonders of the Universe". Archived from the original on 2 April 2011. Retrieved 29 March 2011. ^ "Jonathan Ross welcomes Matt Smith to his Friday night show". BBC. 26 March 2010. Archived from the original on 21 April 2014. Retrieved 4 October 2012. ^ Naughton, Philippe; Costello, Miles (24 February 2008). "A Life in the Day: Dr Brian Cox". The Times. London. Retrieved 6 January 2011. ^ Caspar Llewellyn Smith (4 April 2010). "Brian Cox: The man with the stars in his eyes". The Observer. London. Retrieved 6 December 2010. ^ a b c d Cox, Brian Edward (1998). Double diffraction dissociation at large momentum transfer (PDF). desy.de (PhD thesis). University of Manchester. OCLC 644443338. EThOS uk.bl.ethos.675409. Archived from the original (PDF) on 14 November 2014. ^ Cox, B. (2005). "A review of forward proton tagging at 420m at the LHC, and relevant results from the Tevatron and HERA". 753: 103–111. arXiv:hep-ph/0409144. doi:10.1063/1.1896693. ^ Cox, B.; Forshaw, J.; Lee, J.; Monk, J.; Pilaftsis, A. (2003). "Observing a light CP-violating Higgs boson in diffraction". Physical Review D. 68 (7). arXiv:hep-ph/0303206. Bibcode:2003PhRvD..68g5004C. doi:10.1103/PhysRevD.68.075004. ^ Cox, B.; Forshaw, J.; Heinemann, B. (2002). "Double diffractive higgs and di-photon production at the Tevatron and LHC". Physics Letters B. 540 (3–4): 263–268. arXiv:hep-ph/0110173. Bibcode:2002PhLB..540..263C. doi:10.1016/S0370-2693(02)02144-5. ^ Brian Cox. "Brian Cox: CERN's supercollider – TED Talk". ted.com. ^ Brian Cox. "Brian Cox: What went wrong at the LHC – TED Talk". ted.com. ^ Brian Cox. "Brian Cox: Why we need the explorers – TED Talk". ted.com. ^ Chatrchyan, S.; Khachatryan, V.; Sirunyan, A. M.; Tumasyan, A.; Adam, W.; Aguilo, E.; Bergauer, T.; Dragicevic, M.; Erö, J.; Fabjan, C.; Friedl, M.; Frühwirth, R.; Ghete, V. M.; Hammer, J.; Hoch, M.; Hörmann, N.; Hrubec, J.; Jeitler, M.; Kiesenhofer, W.; Knünz, V.; Krammer, M.; Krätschmer, I.; Liko, D.; Majerotto, W.; Mikulec, I.; Pernicka, M.; Rahbaran, B.; Rohringer, C.; Rohringer, H.; et al. (2012). "Observation of a new boson at a mass of 125 GeV with the CMS experiment at the LHC". Physics Letters B. 716: 30. arXiv:1207.7235. Bibcode:2012PhLB..716...30C. doi:10.1016/j.physletb.2012.08.021. ^ Butterworth, J. M.; Cox, B. E.; Forshaw, J. R. (2002). "WW scattering at the CERN LHC" (PDF). Physical Review D. 65 (9). arXiv:hep-ph/0201098. Bibcode:2002PhRvD..65i6014B. doi:10.1103/PhysRevD.65.096014. ^ "brian cox – Search Results – INSPIRE-HEP". inspirebeta.net. ^ Cox, Brian; Forshaw, Jeff (2010). Why Does E=mc2? : (And Why Should We Care?). Cambridge, MA: Da Capo Press. ISBN 978-0-306-81876-9. ^ Cox, Brian; Forshaw, Jeff (2011). The Quantum Universe : everything that can happen does happens. London: Allen Lane. ISBN 978-1-84614-432-5. ^ Jones, Graham (2011). Measurement of dijet production at √s = 7 TeV with the ATLAS detector (PhD thesis). University of Manchester. ^ Monk, James William (2006). Study of central exclusive production (PDF) (PhD thesis). University of Manchester. ^ Nasteva, Irina Naskova (2006). Exclusive Higgs production and decay to WW(*) at the LHC and semiconductor tracker studies for the ATLAS detector (PhD thesis). University of Manchester. Archived from the original on 11 December 2017. Retrieved 18 January 2015. ^ Osorio Oliveros, Andres Felipe (2006). WW scattering studies for a future linear collider (PhD thesis). University of Manchester. Archived from the original on 17 January 2016. Retrieved 18 January 2015. ^ Pilkington, Andrew Denis (2006). Central exclusive production in TeV energies (PhD thesis). University of Manchester. Archived from the original on 11 December 2017. Retrieved 18 January 2015. ^ "Prof Brian Cox". uktv.co.uk. UKTV. ^ "In Einstein's shadow". BBC. January 2005. Retrieved 6 September 2008. ^ "Professor Brian Cox". Sue Rider Management. Retrieved 6 September 2008. ^ "Wonders of the Solar System". BBC. Retrieved 4 April 2010. ^ "Brian Cox answers your questions about life, the universe and everything". The Guardian. London. 24 March 2011. ^ "Space Hoppers". BBC. Retrieved 4 April 2010. ^ "Science Britannica". BBC. Retrieved 6 August 2014. ^ Neilan, Catherine (25 November 2010). "Ross returns to BBC for Stargazing series". Broadcast. Retrieved 25 November 2010. ^ "Speech by Saul Nassé, Controller of Learning". BBC. 27 September 2010. Retrieved 6 December 2010. ^ Bowbrick, Steve (28 June 2010). "Live chat: science fiction vs science fact". BBC Radio 4. Retrieved 6 July 2010. ^ "The Infinite Monkey Cage Christmas Special, The Infinite Monkey Cage – BBC Radio 4". BBC. Retrieved 2 November 2017. ^ CarPool, Brian Cox on CarPool, 24 July 2009. Retrieved 19 September 2009. ^ "Brian Cox". TED. Retrieved 6 January 2011. ^ "Brian Cox: CERN's supercollider". TED. March 2008. Retrieved 7 July 2014. ^ Perkins, Ceri (February 2009). "ATLAS physicist voted sexiest in the world". ATLAS eNews. Archived from the original on 23 July 2011. Retrieved 7 July 2014. ^ Landmark Apple Store Event for Professor Cox, press release from HarperCollins, 24 November 2010. Retrieved 6 December 2010. ^ "Brian Cox To Reveal Frankenstein Science". westendtheatre.com. 23 November 2010. Retrieved 27 January 2018. ^ Ling, Thomas (29 March 2017). "Brian Cox just inspired a new generation of physicists with an appearance on Postman Pat". Radio Times. Retrieved 24 February 2019. ^ "Brian Cox: Space, Time & Videotape". BBC Four. 9 November 2014. ^ "Life of a Universe". Australian Broadcasting Corporation. ^ "Brian Cox Discography at Discogs". discogs. 3 March 1968. Retrieved 31 December 2011. ^ 1968-, Cox, Brian,. Universal : a guide to the cosmos. Forshaw, J. R. (Jeffrey Robert), 1968-. London. ISBN 9781846144363. OCLC 965118761. ^ "2010 Kelvin medal and prize". Institute of Physics. 2014. Retrieved 7 July 2014. ^ "Professor Brian 'chuffed' with OBE". The Sun. London. 12 June 2010. ^ "No. 59446". The London Gazette (Supplement). 12 June 2010. p. 9. ^ Cox, Brian; Cohen, Andrew (2010). Wonders of the Solar System. London: Collins. ISBN 978-0-00-738690-1. ^ Cox, Brian; Cohen, Andrew (2011). Wonders of the Universe. New York: Harper Design. ISBN 978-0-06-211054-1. ^ "Brian Cox receives degree from Sir Patrick Stewart". BBC. Retrieved 12 November 2012. ^ "IOP Awards 2012: Professor Brian Cox delivers a key note speech". ^ "Conferment of Honorary Degrees and Presentation of Graduates" (PDF). The Open University. 2012. Archived from the original (PDF) on 21 February 2014. Retrieved 7 July 2014. ^ "The Royal Society Michael Faraday Prize". Royal Society. Retrieved 17 October 2012. ^ "UK needs a visionary leader, says Professor Brian Cox". The Irish News. 4 May 2017. Retrieved 25 June 2018. ^ "'At least 100,000' march for vote on final Brexit deal". Sky News. 23 June 2018. Retrieved 25 June 2018. ^ Falk, Ben (2012). The Wonder of Brian Cox – The Unauthorised Biography of the Man Who Brought Science to the Nation. John Blake Publishing Ltd. ISBN 978-1-84358-953-2. ^ Woods, Mark (9 September 2016). "Professor Brian Cox condemns 'toxic' rows between science and religion". Christian Today. Retrieved 12 September 2016. ^ "Authors read their contributions to Ariane Sherine's book". The Guardian. London. 2 December 2009. Archived from the original on 2 February 2017. ^ "Professor Brian Cox OBE". British Humanist Association. Archived from the original on 16 May 2011. Retrieved 31 March 2011. Wikimedia Commons has media related to Brian Cox (physicist). This page was last edited on 5 April 2019, at 19:43 (UTC).